While this site is principally dedicated to, and focused on, solar cooking we realize that there are a number of ways that solar energy can be utilized for the benefit of the human race and the well being of our lands and natural resources. Admittedly one of the best sources for information on the subject can be found at Wikipedia, the Free Encyclopedia, where you will find an exhaustive compendium of information and references on the subject. Most people are familiar with the more renowned solar energy technologies (listed below) that are widely available on the market today and designed to harness the power of the sun for use in generating electricity. Solar Panels, or as they are more technically known, photo-voltaic panels; are comprised of a number of photo-voltaic cells tied together with an electrical wiring structure that, when exposed to the sun will generate electricity for use by the consumer of such. Solar Thermal Collectors which may include solar hot water panels; used for heating water, and other collectors such as a solar parabolic, solar trough and solar towers. These are designed to collect heat, or rather, absorb sunlight to create heat. These collectors are mainly used to heat water to produce steam to run turbines that generate electricity. Solar Energy is also used for heating of water for residential and industrial uses for bathing, cooking, sterilizing, heating and cooling and more. 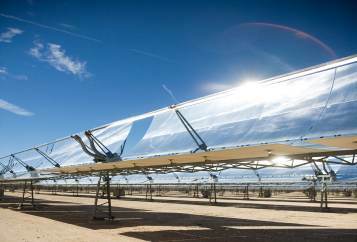 This form of solar energy conversion is accomplished in a manner very similar to the solar thermal collectors used for "steam-to-turbine-to-electrical" generation. Other alternative energy sources include; hydro (water) wind, geothermal, wave power, and tidal power. All of these are currently available to one degree or other as viable sources of energy albeit some are not as economically feasible as others due to labor, material and developmental costs. A number of governments and businesses are developing and advancing these different technologies to variable degrees. Australia is taking advantage of their abundant solar energy capacity, this being one among many other less developed resources. These are just a few examples of the many throughout the world on small and large scales being developed and implemented for the benefit of both the individual, private enterprise, and the world as a whole. You can find further information at the aforementioned sites and also information from manufacturers and installers of these available systems and technologies by visiting some of out partner sites below. FREE: Solar Energy Guide Ebook download in PDF format. Very helpful and informative E book on all things Solar Energy, including solar cooking. How do you use solar energy (or other) to conserve/save energy, money and resources? Do you live off grid? What has worked for you? What would you do differently? Not living off grid, but still use alternative sources of energy, what do you do? We would love to hear how you have used solar energy, as well as other forms of alternative energy, to make you life a little better and the world a nicer place for all.